Maverick is an indicator who works with almost all the forex currencies and brokers. Only for M5 timeframe. Please, don't use it with Commodities, Indices, Bonds, Cryptos, Stock, Futures and Exotic Currencies. 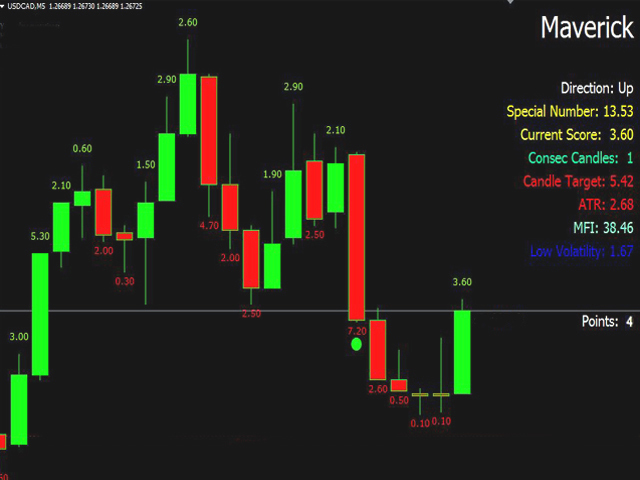 Maverick has an algorithm that warns you for a possible change of price direction, during the following minutes. With Maverick, it's very easy to trade: you've only to read the comment "Points" on charts of your MT4 platform to find out the best time to trade. Points range is from 0 to 10: the higher the Points, the more likely the direction has to change during next minutes. Maverick tells you when a reversal point is reached; so you have to pay attention to the Points you see on the display, to enter the market as soon as possible and gain 3-4 pips in few minutes. Besides "Points", the other comments you may see on the graph, may help you to understand better the operation of Maverick. ATR that measures volatility and shows the degree of investors interest toward a currency pair. MFI is a momentum oscillator that measures the trading pressure of buyers and sellers; according to our calculation, we set the overbought area between 85 and 100 and the oversold, between 15 and 0. CANDLE TARGET represents the value that the candle has to reach to have an alert. The red or green circle above or below a candle mean that Candle Target value is reached. CT value is updated every hour. CONSEC CANDLES is the consecutive numbers of candles that walk in the same direction. CURRENT SCORE is the sum of Pips of the consecutive candles. SPECIAL NUMBER when Current Score reaches Special Number value, you have an alert. This value may change several times during a day trading. DIRECTION is the trend of the current candle: if it's UP is bullish; if it's DOWN is bearish. LOW VOLATILITY represents the lower point of volatility calculated at that time. ExtMFIPeriod: to set the overbought/sold period of the Money Flow Index. InpATRPeriod: the period for the Average True Range indicator. MFIBuyLevel: the overbought value of MFI. By default is 85. MFISellLevel: the MFI oversold value. Points_for_Alert: the Points (score) you prefer to receive an alert message. Consec_Candles_for_Alert: the number of the consecutive candles of the same direction for which you want to be warned. Enable_Consec_Candles_Alert: set to TRUE if you want to receive the consecutive candles alert. Enable_Candles_Score_Alert: if TRUE, you'll be warned when the sum of the length of the consecutive candles (Current Score) reaches and/or exceeds the Special Number. Enable_Early_Alerts: set TRUE to see circles above or below the candles that reach Candle Target. Enable_CandleTarget_Notifications: with True, when a candle reaches Candle Target, you’ll receive an alert (DOT); at the same time, a circle will appear above or below the last candle. Enable_Email_ CandleTarget_Notifications (or mobile): after setting your email parameters on MetaTrader, if it’s True, you will receive a message alert on your email/smartphone: it tells you that Candle Target has been reached. Notifications_Update_Minutes: you can choose how many minutes you like to receive mail/smartphone notifications. Enable_Email_Alerts/Mobile_Alerts: allows you to exclude or activate any alert on your email and/or cellphone. signal_size: the size of the circle (symbol). signal_pips_distance: the distance between a circle and its candle. Show_Comments: to see or not the Comments on your charts. Text_Color: change the color of "Maverick" and "Direction" text. Font_Name: choose a font compatible with your OS. Font_Size: choose the size of the font. Corner: the place of your display where you see the comments. 1 is up on the right; 2 is down on the left; 3 is down on the right; 4 is up on the left. TopGap: distance between the comments and the top/bottom of the chart. OffSet: distance between the comments and the left/right side of the chart. dy: the line spacing of the single letters of the comments. As a fan of accuracy, with this new version (2.1), I solved a small problem concerning the correct MFI value.